NATO peacekeepers have used tear gas against Serb protesters in northern Kosovo. They dispersed the crowd in order to start dismantling barricades erected in a protest against deployment of customs checkpoints on the border. The tension has already spilled into violence in Kosovo, reports RT’s Maria Finoshina. One Serb was gunned down and two wounded near the city of Pec in the west of the province. The shooting was done by their Albanian neighbor, she says. 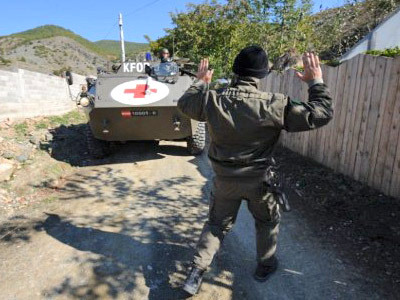 Meanwhile some 300 Serbs tried to prevent the Kosovo peacekeeping force (KFOR) from tearing down the barricades in Kosovo’s north, but the soldiers were armed with anti-riot equipment to cordon off the barricaded area. KFOR used loudspeakers to try to convince the Serb to go home, but it failed to help. There was a lot of shouting from both parties, but otherwise the conflict was not violent. NATO soldiers fired tear gas grenades at the protesters and managed to disperse them, says AFP. RT's Maria Finoshina says it was more likely pepper spray than tear has. She adds KFOR is erecting a barbed wire fence to isolate Serbs from the barricade and threatens to use force against them. At least 100 armed transport vehicles are involved in the operation, which is aimed at removing the 16 barricades on the border. KFOR is also using a number of drones, which are circling over the area of the conflict. 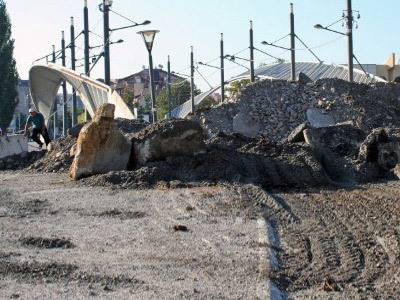 The actual dismantling of the barricades has not started yet and Serbs are watching KFOR actions closely. The tension remains high. NATO action follows a week of tense negotiations with the protesters, which failed to produce a peaceful solution. 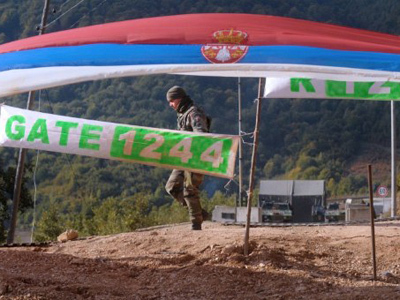 Serbs living in northern Kosovo had blocked two cross-border roads into Belgrade-controlled Serbian territory in July. The move was in a protest by Pristina’s plan to take over checkpoints at the crossings. This was meant to enforce a ban on imports from Serbia, which was part of a trade dispute with Belgrade. Officials in Pristina said ethnic Serbian customs officers had sabotaged the ban and planned to replace them with ethnic Albanians. Northern Kosovo is home to some 40,000 Serbs, who constitute a majority in several towns in the area. They do not recognize the Albanian government in Pristina. Many of them complain of persecution by Albanians. John Laughland from the Paris-based Institute for Democracy and Co-operation blames KFOR for igniting the border tension. “What’s happening today in northern Kosovo is the direct result of this ridiculous idea that Kosovo can be an independent state. KFOR and EULEX, the European Union authorities, which now run Kosovo – illegally, by the way, because only the UN has authority in Kosovo – are determined to push this policy through to its logical conclusion. I’m afraid it’s a very bad sign for those Serbs who are hanging on to the north of the province,” he told RT. ­Serbs are ready to offer some concessions in the conflict, but NATO wants the one thing the barricade defenders would not agree to, says Belgrade-based political analyst Aleksandar Pavic. ­Serbian-Canadian documentary filmmaker Boris Malagursky views the protests as a fight for survival by the Serbs of northern Kosovo. 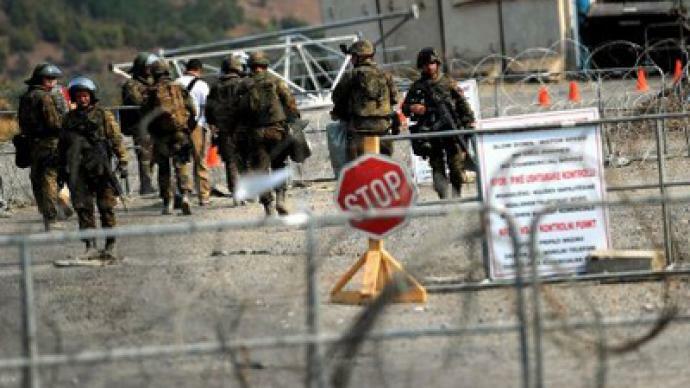 "They are living in horrible conditions, basically in a ghetto, so their presence on the barricades is a form of silent protest against what NATO has planned for Kosovo. And Serbs have no intention of giving up. If this was organized by a regime that is supported by the West, they would have been hailed as freedom fighters," Malagursky told RT.